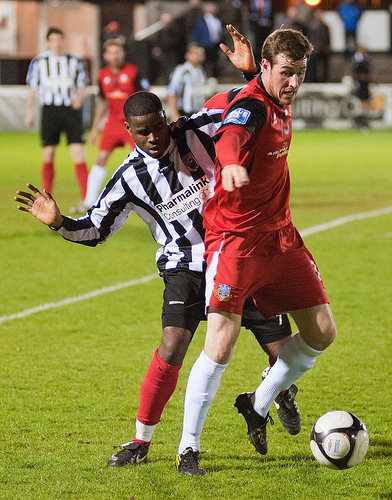 Shaun McAuley holds off the tackle of Maidenhead's Martel Powell. Three days after a 3-1 victory against Thurrock on Saturday Ian Baird’s Eastleigh failed to get a point at York Road against 20th placed Maidenhead United. Ex Spitfire Will Hendry scored the only goal from a header to leave The Spitfires in 7th place and two points away from a play-off spot. Eastleigh now play 3rd placed Ebbsfleet United at The Silverlake Stadium in the Blue Square Bet South. Liam Daish’s Ebbsfleet United managed to thrash bottom placed St Albans City 4-0 at home last Saturday.Calum Willock,Ram Marwa,Michael West and Scott Ginty all scored for The Fleet. The Spitfires will have keep an eye on Calum Willock, the formal Fulham striker has netted 19 times this season in the league, one less than Eastleigh’s hot-shot striker Jamie Slabber. The Fleet have won three, drawn two and have lost one out of their last twenty games ,Eastleigh on the other hand have been inconsistent lately having lost three and won three out of their last six games. Ebbsfleet United have kept four clean sheets (two of them being away) and have failed to score four times (two of them being away) out of their last twenty games. The Spitfires have kept six clean sheets (two of them being at home) and have failed to score four times (three of them being at home) in their last twenty games. The last time the two met was at Stonebridge Road in February where the result was 2-2. Jamie Slabber opened the scoring for the Spitfires after heading a goal from a Tony Taggart corner. However the lead only lasted three minutes when former Spitfire Ashley Carew whipped a quick free kick on the left which saw Calum Willock catching out the Eastleigh defence and scoring with a low header. Eastleigh’s right back Warren Goodhind fouled Ricky Shakes which seemed to be outside of the penalty box and received a yellow however many could argue that it was a straight red offence as he brought down the last man. Ashley Carew converted the penalty which added salt to Eastleigh’s wounds. Anthony Riviere sliced a shot in the 47th minute which Shaun McAuley collected and did well to cross back to Riviere where it flicked past goalkeeper Preston Edwards to seal a well earned point for The Spitfires. Warren Goodhind still has one match ban after a straight red against Welling United last month. The Fleet have only lost three this season in the league away against Weston-Super-Mare, Woking and league leaders Braintree so they will be tough team to beat. Ebbsfleet United have also won twelve and drew four on the road in the league this season.